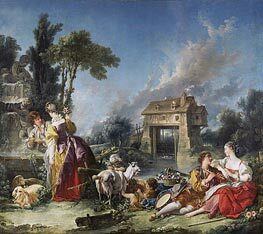 François Boucher (September 29, 1703 – May 30, 1770) was a French painter, a proponent of Rococo taste, known for his idyllic and voluptuous paintings on classical themes, decorative allegories representing the arts or pastoral occupations, and several portraits of Madame de Pompadour. 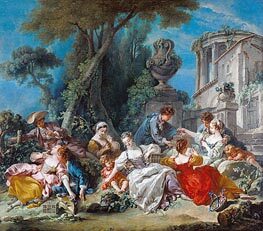 Born in Paris, the son of decorator Nicolas Boucher, François Boucher was perhaps the most celebrated decorative artist of the 18th century, with most of his work reflecting the Rococo style. 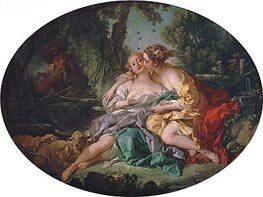 At the young age of 17, Boucher was apprenticed by his father to François Lemoyne, however after only 3 months he went to work for the engraver Jean-François Cars. 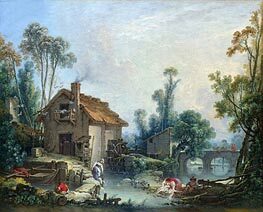 Within 3 years Boucher had already won the elite Grand Prix de Rome, although he did not take up the consequential opportunity to study in Italy until 4 years later. 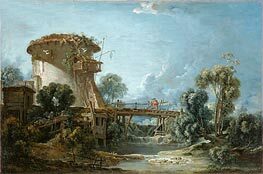 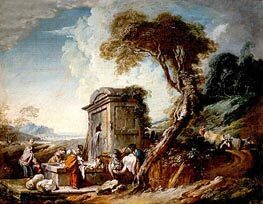 On his return from studying in Italy in 1731, he was admitted to the Royal Academy of Painting and Sculpture as a historical painter, and became a faculty member in 1734. 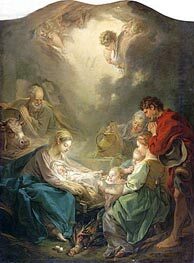 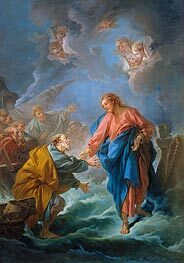 His career moved upwards and onwards from this point, as he advanced from professor to Rector of the Academy, becoming head of the Royal Gobelin factory in 1755 and finally Premier Peintre du Roi (First Painter of the King) in 1765. 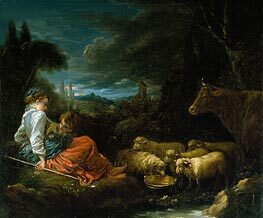 With much of his work reflecting inspiration gained from artists Watteau and Rubens, Boucher's early work celebrates the idyllic and tranquil, portraying nature and landscape with great élan. 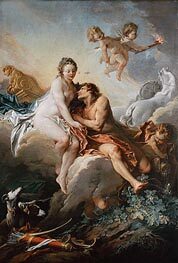 However, his work typically forgoes traditional rural innocence to portray scenes with a definitive style of eroticism, and his mythological scenes are passionate and amorous rather than traditionally epic. 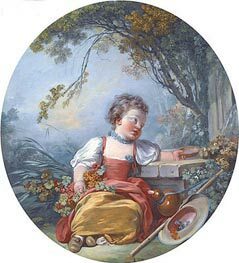 Marquise de Pompadour (mistress of King Louis XV), whose name became synonymous with Rococo art, was a great fan of Boucher's, and it is particularly in his portraits of her that this style is clearly exemplified. 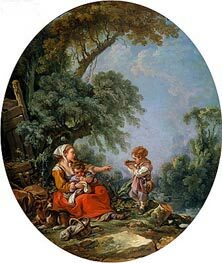 Paintings such as The Breakfast of 1739, a family scene, also show Boucher as a master of the genre scene as he regularly used his own wife and family as models. 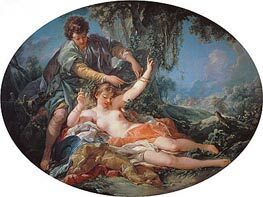 These intimate family scenes are however in contrast to the licentious style in which he also painted, as seen in his Odalisque portraits. 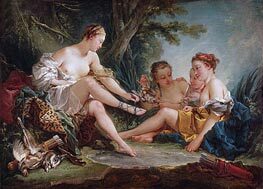 The dark-haired version of the Odalisque portraits prompted claims by Diderot that Boucher was "prostituting his own wife", and the Blonde Odalisque was a portrait that illustrated the extra-marital relationships of the King. 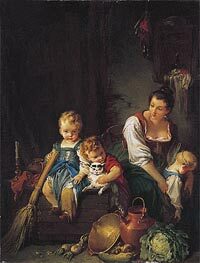 Boucher gained lasting notoriety through such private commissions for wealthy collectors and, after the ever-moral Diderot expressed his disapproval, his reputation came under increasing critical attack during the last of his creative years. 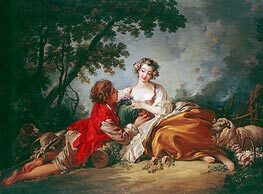 Along with his painting, Boucher also designed theatre costumes and sets, and the ardent intrigues of the comic operas Favart (1710-1792) closely parallel his own style of painting. 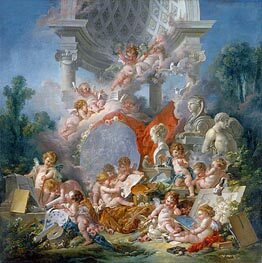 Tapestry design was also an interest and major activity of his, together with his design activities for the opera and the royal palaces of Versailles, Fontainebleau and Choisy. 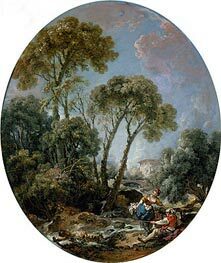 His design activities for all of the aforementioned augmented his earlier reputation, resulting in many engravings from his work and even reproduction of his themes onto porcelain and biscuit-ware at the Vincennes and Sèvres factories. 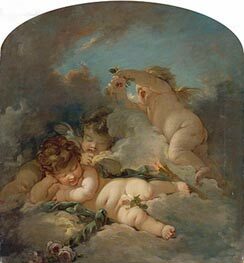 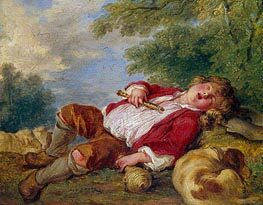 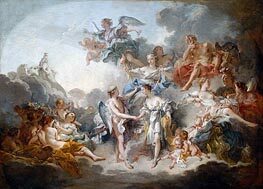 Francois Boucher died on May 30, 1770 in Paris, France. 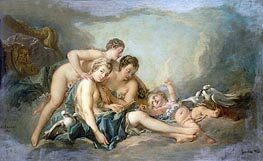 His name had become synonymous with the French Rococo style, along with that of his patron, Madame de Pompadour, leading the Goncourt brothers to write: "Boucher is one of those men who represent the taste of a century, who express, personify and embody it."